Solid mountain cherry planks are traditionally used in Japan for Moku Hanga (the Japanese style of printmaking). At one time skilled craftsmen made cherry blocks for printers, drying the wood for many years, joining small pieces to make larger blocks, reinforcing the ends so they would not warp and hand-planing them to a perfectly smooth surface. But those times are gone and so is most of the cherry trees that they used. Regular plank cherry has its drawbacks. It likes to warp and sizes are limited by the size of the trees still available. Enter our new Cherry Plywood blocks. But this isn't just any cherry plywood. This plywood is made by a carpenter and craftsman in Maine who also happens to be a relief printmaker. He has been making these blocks for friends as well as his own use for several years and he knows what works. The cherry veneer is made from native New England black cherry. Because it grows in the cold north, the wood is very dense and close-grained, very similar to the mountain cherry of Japan. It is milled into 1" planks and air-dried under cover outside until it reaches 12% humidity. Then the wood is brought indoors to air dry until it reaches 6% - 8% humidity. The wood used to make these blocks has been drying for four years. The top, dark layer is 1/8" cherry. The bottom, lighter layers are Baltic Birch plywood. Total thickness is 15mm or just shy of 5/8"
A 1/8" thick veneer is cut from the face of the plank. That is much thicker than the veneers found on commercially available plywood and means almost never carving through to the wood beneath. The cherry veneer is applied to 12mm (approximately 1/2") white baltic birch plywood. The A side of the birch plywood, which has fewer splices and a more consistent grain pattern than the B side, is on the opposite side of the block from the cherry. While it may be possible to carve and print the birch side as well as the cherry, we do not guarantee it because there may be flaws in the birch. All of the plies in the baltic birch plywood are high quality birch. Baltic birch plywood is free of any voids; however small knots may occasionally show up in the inner plies. These blocks are very flat and level, so they can be printed either by hand or on a press. Sizes 4 x 6 through 12 x 16 are made with a solid piece of seamless cherry veneer. 14 x 18 blocks have one seam in the veneer. This seam is almost invisible, very tight and will not show when printed on a press with oil-based ink. We printed a block with a seam using Moku Hanga, which requires spraying the block with water before applying water-based ink, and could not see the seam on the print. But we have not done a long print run yet using this technique. When we have a more information about how the seams stand up to water, we will pass it along. Because it is plank wood, use woodblock carving tools to carve cherry plywood, not engraving tools. Sharp tools are essential for smooth, easy carving on cherry. Very fine detail can be cut into these blocks and printed repeatedly without the wood breaking down. The blocks come planed and sanded to a smooth, printable surface. You can sand them even smoother using 400 or 600 grit sandpaper. Wrap the sandpaper around a block of wood or use a rubber sanding block and always sand parallel to the grain of the wood, not across it. After printing, store the blocks flat in a dry place and keep them away from excessive heat or moisture to avoid warping. 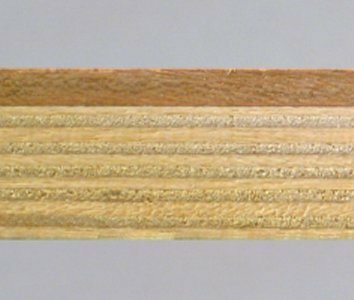 In all cases the grain of the veneer on both sides runs parallel to the longest dimension. Unlike wood which has distinctive growth rings that are very different in density, such as fir or pine, there is virtually no difference in the hardness of the growth rings of black cherry. Because of this, cherry is used to make prints that do not show grain pattern. Baltic Birch is softer and has a straight grain pattern which will show up if light applications of ink are used. If you have not tried carving Cherry before and you live in the U.S., we will be happy to send you one small sample for free. Please call 800-832-4264 or email your name and address to mail@imcclains.com. Receive a 5% discount on orders of 12 or more of the same size Cherry Plywood blocks. Different sizes cannot be combined for this discount. Custom size blocks are not available, however we can cut larger blocks down into smaller sizes for you. The cutting fee is $0.25 per cut. Allow one week for custom size blocks to be cut and shipped. *Currently out of stock. More should arrive in April/May, 2019. If you order one of these blocks, it will be placed on backorder and shipped as soon as possible. You will not be charged until we ship it and there is no additional shipping charged on backorders shipped within the U.S. Thank you for your patience.